Bookings are handled by our Business Manager. 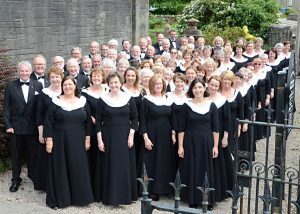 As well as promoting its own concerts the choir is available for hire for fundraising or performance events from large Arts and Music Festivals and Corporate Functions to small church fundraising concerts. In the past the choir has performed at the BBC Proms London, Celtic Connections Music Festival Glasgow, The West End Festival Glasgow, concerts for the Gubbay Organisation, soundtracks for Channel 4 television, and many other events. Most recently, supporting Aled Jones at Paisley Abbey in the first concert of his 2017 UK Tour. It isn’t all serious though, and some of the choir have previously been involved in the filming of BBC Scotland’s TV comedy “Still Game“. At the moment the fees for such engagements begin at £650.00 + VAT depending on the nature of the event and venue, plus expenses generally consisting of coach hire and modest choir subsistence. Running a choir like this is an expensive business, despite being a not-for-profit organisation. The above fee structure assists the Choir in meeting its costs for Conductor’s and Accompanist’s professional fees, the purchase and commissioning of music for Choir performance and general administrative charges. Should you book the choir we may also be able to facilitate the printing of tickets and posters/fliers (A5, A4 & A3 sizes) for your own distribution, and tickets can be booked online through www.wegottickets.com. Individual concerts will have their own link once they’ve been added to the site. (contact our Business Manager for full details). Promotion of your event by newspaper and media advertising and the distribution of posters and fliers for example would, however, remain your own responsibility – we would not normally promote your event except for a listing on the concert page of this website with a link to online ticket sales if required, as described above. Please also note that whilst you may have read elsewhere on this site that the choir has approximately 120 singing members, it would be unusual for every member to perform every concert. 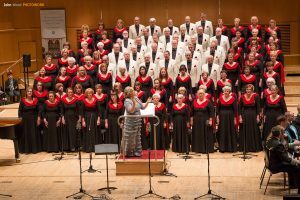 Being an amateur organisation we are dependent to some extent on the availability of singers subject to professional and personal commitments as well as the usual holiday and illness absences. Our aim is to provide a balanced sound suitable for the particular venue, and a typical concert complement would consist of between 50 and 70 singers at the discretion of the Conductor. For more formal concerts ladies wear full length black dresses with white chiffons, and gents wear black dinner jackets with white handkerchiefs as shown in the picture. For less formal surroundings, the gentlemen have white dinner jackets with coloured or tartan handkerchiefs and the ladies replace their white chiffons with a coloured or tartan one as shown on the right. Click on either image for a bigger picture. 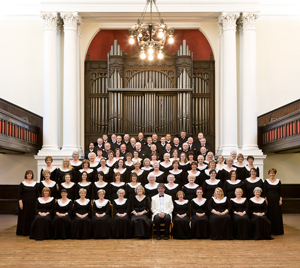 For more details and how to book the choir for your event, please contact our Business Manager.